Here’s an article I wrote about the inspirations behind my novel, The Invasion. In it you’ll read about my boyhood fear of home invasions, the Manson murders, and my thoughts on horror fiction writers writing stories from fear. Check it out at Shotgun Logic. Are you a fan of home invasion movies? I am. I’m a sucker for any and all horror/thrillers that deal either in part or wholly with the terrifying threat of a home invasion. I’ve seen a lot of home invasion movies, it’s one of my favourite sub-genres, and so I thought I’d narrow the pile down to the ten most memorable. My thanks to Matt and the good people at Addicted To Horror Movies for allowing me to invade their site. 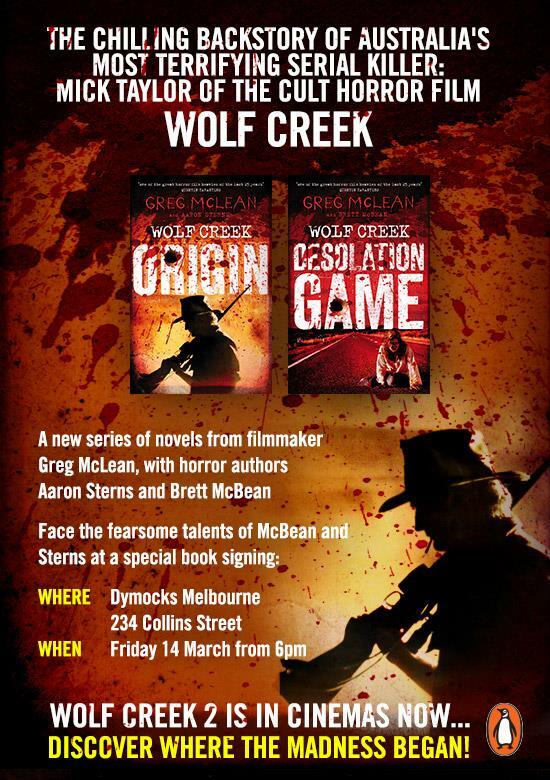 Aaron Sterns and myself will be at Dymocks, Melbourne, on the 14th of March, signing copies of the Wolf Creek prequel novels. It should be a great evening, so we’d love to see you there. Details of the event can be found here. *UPDATE: The five winners have been decided, so the competition has ended. Thanks to all who played and congratulations to the five winners! For the record, my all-time favourite Aussie horror movie is: LONG WEEKEND (1978). To help celebrate the release of the Wolf Creek novels, I’m giving away five signed copies of the second installment, Desolation Game. As Wolf Creek is one of Australia’s greatest horror movies, I thought I’d make the competition Oz Horror related. All you have to do is guess my all-time favourite Australian horror movie (note: Wolf Creek is out of the running as an answer, for obvious reasons). The first five correct guesses each win a signed copy of Desolation Game: Wolf Creek Book 2. Send your guesses to either my email address (brettmcbean@hotmail.com) or a PM on Facebook. Happy guessing! Well folks, I can finally announce a project I’ve been eager to share for a while now. 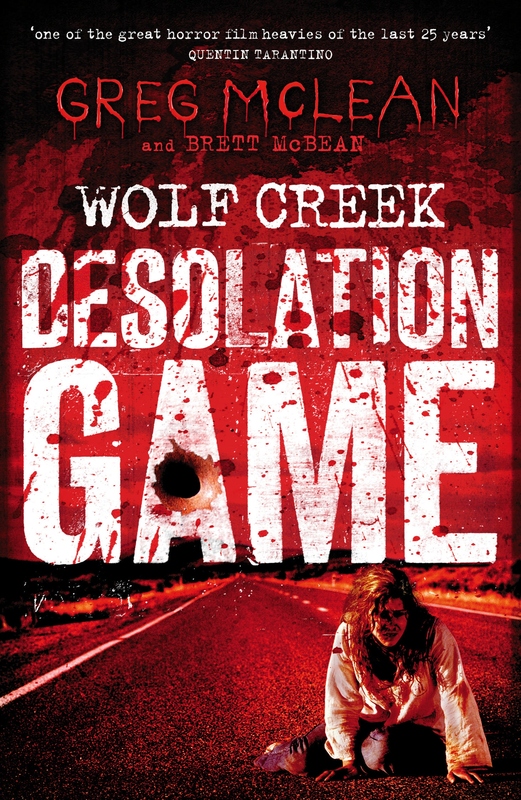 Coming soon from Penguin Books Australia – Desolation Game: Wolf Creek Book 2, by Brett McBean and co-written with writer/director Greg McLean. Penguin Books plan on releasing six prequel novels, all original stories that chart the bloody rise of Australia’s favourite fictional psychopath – Mick Taylor. The first two prequel novels (Origin, co-written by Aaron Sterns and McLean and Desolation Game) are scheduled for release January 2nd 2014, in the lead-up to the release of the second Wolf Creek film in February. I couldn’t be more honoured to be a part of this iconic Oz Horror film series, and I hope readers will embrace these original novels. When sharpshooter and killer Mick Taylor searches for a place to keep a low profile, he finds somewhere where his peculiar talents are appreciated: a war. And in Vietnam, an out-of-control sergeant takes the amateur murderer and turns him into a pro. Back home, Mick makes use of the sick lessons the army taught him, when hapless tour operators bring a Kombi-load of sightseers out his way into the Western Australian desert. Two suspicious flat tyres deliver an engaged Japanese couple, a father and son, a US army vet and his girlfriend, and a couple of cute girls to Mick’s lair. Middle of nowhere, population one. The group finds themselves in hell, as Mick makes sure their once-in-a-lifetime tour stays that way. And though one of the drivers escapes and goes for help, Mick sees no reason to stop the killing spree. In the second Wolf Creek prequel novel, the cult film’s writer/director Greg Mclean and horror writer Brett McBean get to the heart of Australian horror’s most terrifying psycho killer. Is Mick Taylor possessed by some dark power in the landscape itself? Something ancient? Does the Red Centre demand blood?